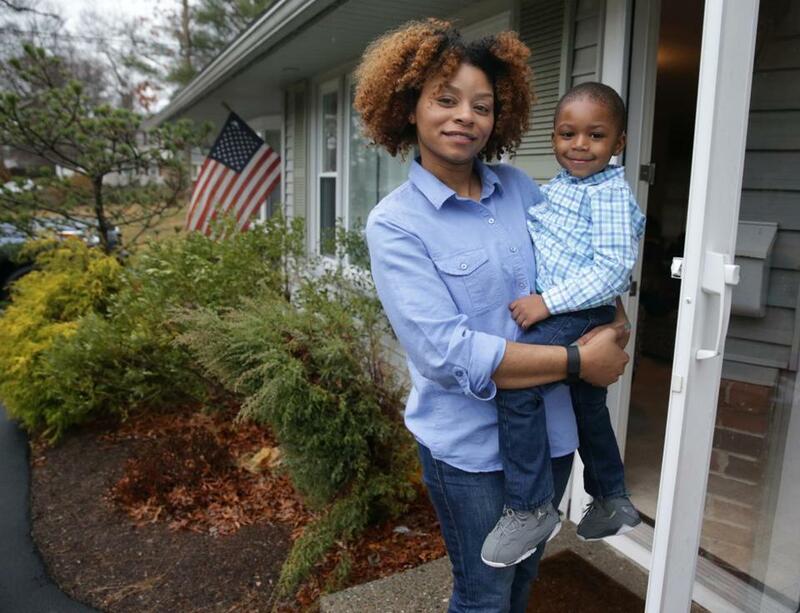 Naomi Cordova, a first-time homeowner, lives in a four-bedroom ranch-style home in Brockton with her 2-year-old son Ethan Studmire. Naomi Cordova didn’t want to buy a home in Brockton. In fact, she was dead set against it. But the working-class city is where Cordova ended up, despite the fact that she’s employed at a tech company in downtown Boston and makes more than $90,000 a year. With a price tag limit of$275,000, little money for a down payment, and no desire to buy a fixer-upper, Cordova, a 34-year-old single mother of Puerto Rican and African-American descent, felt she had few other options. The city, which she associates mainly with its gang violence, isn’t where she feels she belongs. “I want to live in a neighborhood where I feel like the makeup of the neighborhood is more representative of where I’m at in my life,” she said. Cordova’s reluctant arrival in Brockton underscores the racial divisions in homeownership around the region. Brockton was among five cities in the state — along with Boston, Worcester, Springfield, and Randolph — that accounted for nearly half of all loans to black borrowers for home purchases in 2015, according to the latest annual report on mortgage lending to underserved populations by the Massachusetts Community & Banking Council. In 86 of the state’s 351 cities and towns, not a single loan was made to a black or Latino home buyer. Even in Boston, where people of color make up the majority of the population, many neighborhoods still have stark racial divides, despite efforts to desegregate schools and public housing. In 2015, black households received 41 percent of all the home-purchase loans in Mattapan, but none in the Back Bay, Beacon Hill, the North End, Allston, the Fenway, downtown, Mission Hill, or the South Boston Seaport area, according to the banking council. Latino borrowers received 21 percent of the loans in Hyde Park, but none in the Fenway, the North End, Mission Hill, or the Seaport. These disparities are not just about people of color being denied loans; they also reflect the lack of minorities applying for mortgages in certain areas, said Jim Campen, a University of Massachusetts Boston professor emeritus who conducts the yearly study for the group. And this segregation has persisted despite laws designed to reverse the damage done by decades of discriminatory housing practices. Some people are reluctant to leave neighborhoods where their family and friends have lived for generations; others are held back by reports of racism when black or Latino families move to white suburbs. Finances are perhaps the biggest deterrent. People of color tend to have fewer assets and fewer family members they can borrow from — a racial wealth gap that puts them at a distinct disadvantage when it comes to securing a loan. That, in turn, makes it less likely that minorities can afford to buy a home in a more expensive area, such as the Back Bay or wealthier suburbs. Blacks and Latinos also have higher rates of single mothers, which limits their ability to buy homes in more affluent areas. And staying in poverty-stricken neighborhoods can have profound consequences for future generations. A wide range of research shows that living in wealthier areas improves children’s health, rates of college attendance, and future earnings. Until she had her son, Ethan, now 2, homeownership wasn’t a priority for Cordova. She grew up in rented apartments in and around Boston and was among the first in her family to go to college. Few members of her extended family own homes or had extra money to help her out, she said. She is still paying down more than $30,000 in student debt and wasn’t able to save much money for a down payment. After qualifying for a mortgage through MassHousing that required only 5 percent down, she started looking in Weymouth, where she was renting an apartment, as well as in Quincy, Holbrook, and Stoughton. But every house in her price range needed repairs, and her real estate agent suggested Brockton. Cordova, whose earnings are double the median income in Brockton, said she scoffed at the idea at first. But then she found a pristine 1,200-square-foot ranch with a huge yard for her son to play in. Still, she takes a circuitous route when she drives home from Boston to avoid the “seedy” neighborhoods along the way, and she has found herself telling friends that she lives “on the Abington line.” She dreams of moving to a more prosperous town, with better schools for Ethan and more professionals living next door. At the same time, she doesn’t want to raise her son in a lily-white town — a balance she admits may be difficult to achieve. Year after year of mortgage data have shown the difficulty of achieving her dream. Even when they are in the same income bracket as whites, minorities in the Boston region are turned down for mortgages at a higher rate and live in substantially less well-off neighborhoods, according to a study by the Metropolitan Area Planning Council in Boston. The average white family earning $78,000 a year in metro Boston lives in a neighborhood where the median household income is $72,400 a year, while the average black household earning $78,000 a year lives in an area where the median is $51,100 a year. A similar but smaller gap exists for Latinos and Asians. And these disparities persist at all income levels and have grown since 2000, according to the council. Nationwide, black and Hispanic households need to earn roughly five times as much as white households, on average, in order to live in the same neighborhood, according to Russell Sage Foundation research. But money is not the only factor in play. Sandra Suarez, 39, makes a good salary working 60 hours a week at two nonprofits in Lynn. Yet when she started looking for a house, leaving the city was not an option. Suarez grew up there, her mother and brother and sisters were there, her teenage daughters went to school there. She wanted to be part of a community with a strong Latino population and avoid the discrimination she has experienced elsewhere. Suarez previously rented a condo in Swampscott, but recalls hearing the neighbors complaining when her family came to visit: “Why are there so many of them?” “Who are these people using the pool?” She knew Latinos in other cities who were hounded by the police when they turned up their music too loud. “Being scared of racism in other places, I decided to stay” in Lynn, she said. The single mother might be able to afford a wealthier community, but she has no interest in finding out. To her, feeling comfortable is more important. Banks add to the problem by lending disproportionately to middle- and upper-income communities, said Teri Williams, president of Boston-based OneUnited Bank, an African-American owned bank. This creates a vicious cycle. Homeowners in low- and moderate-income areas can’t sell their houses, depressing prices and forcing those who want to move out to stay, even as their incomes rise. The lack of minority realtors also contributes to neighborhood segregation, Williams said. Katie Johnston can be reached at katie.johnston@globe.com.